Though his father Giuseppe was among the finest classical makers of the Turin School, Enrico Rocca (1847–1915) is best considered in the context of the modern Italian tradition. He was born in Turin but moved to Genoa at an early age. In his early working years he was registered at one time as a carpenter and it is thought that he worked in the shipyards of Genoa. 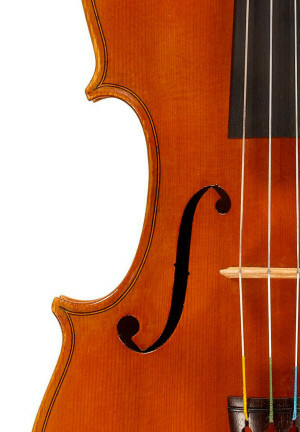 His training in violin making most likely came not from his father but from his contemporary Eugenio Praga, whose conservation of the Paganini ‘Cannon’ Guarneri may have promoted Rocca’s adoption of that particular model for much of his career. 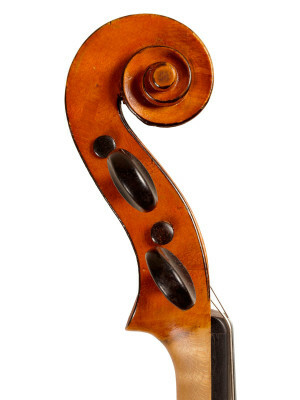 This 1898 example exhibits numerous hallmarks of Enrico Rocca’s style, such as the small and blackened scroll chamfers and the crisp, elongated corners. The narrow purfling, which extends far into the corners to pinched bee-stings, is placed rather far from the edges and passes to the inside of the saddle instead of being interrupted by it.